Need a quick cup of delicious coffee? Try a single serve brewer or brewing method. Below is a quick summary of the most common single serve brewing options. The AEROPRESS is a wonderful, compact single cup pressure brewer. This lightweight little devise consists of a plunger, chamber, and filter. Coffee grounds are placed into the chamber, hot water is poured on top of the grounds, and then the plunger is pressed down into the chamber forcing the water through the grounds, past the filter, and into your cup. Brew time is approximately 1 minute after the hot water is poured on the grounds. This wonderful gadget can travel the world with you and produces a smooth, flavorful cup. Click here to learn how to brew the perfect Aeropress cup. Pros: Environmental friendly, wonderful extraction, not restricted to using a specific brand or form of coffee, portable. Cons: No pre-measured grounds, must clean the AeroPress after each use. BEAN-TO-CUP machines are sophisticated devices that contain both a coffee grinder and single cup brewer. Whole beans and water are placed into their designated chambers; the machine then grinds the beans and brews your coffee. Bean-to-cup machines brew with either a drip or pressure brewing method (for more details on the drip method, check out our Brewing Methods blog entry). Pros: Environmental friendly, superb extraction, not restricted to using a specific brand or form of coffee. Cons: Most require 30-60 second recovery periods (i.e., the time between completing one brew and beginning a new cup), no pre-measured beans, brewing chamber must be cleaned after each use. A COFFEE POD is a pre-measured single serving of packed coffee grounds contained between two rounds of filter paper. Pods work in any pod brewer, which may be a traditional pod machine, espresso machine, or espresso portafilter. Once placed in the brewer’s pod holder, coffee is “brewed” by forcing hot pressurized water through the pod. The full, flat surface of the pod allows for maximum extraction and flavorful cup. Pros: Fully biodegradable, wonderful extraction, pre-measured grounds, minimal cleanup. Cons: Pods are less available than K-cups and whole bean/ ground coffee, the pod must be manually removed from the coffee holder after each cup is brewed. 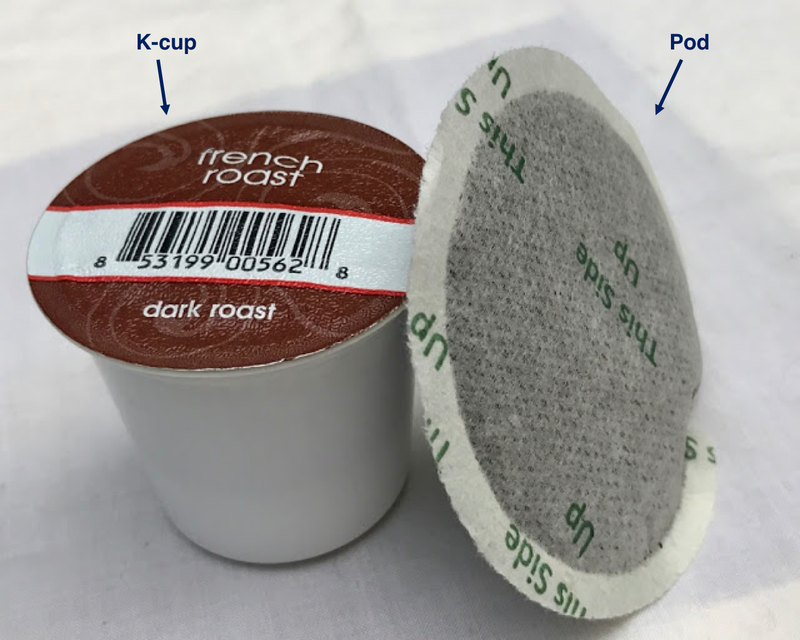 A K-CUP* is a pre-measured single serving of grounds placed in a filter-lined plastic cartridge and sealed with plastic and foil. K-cups must be brewed in a K-cup machine, the most common being the Keurig machine. Once placed in the brewing device, needles puncture both the top and bottom of the k-cup and hot pressurized water is passed through the cup to brew coffee. For greater information on the K-cup vs. the coffee pod, click here. Pros: Widely available, no clean-up required. Cons: Generally, the most expensive single serve option, water must run through foil and plastic to brew coffee, not recyclable unless split, potentially incomplete coffee extraction. 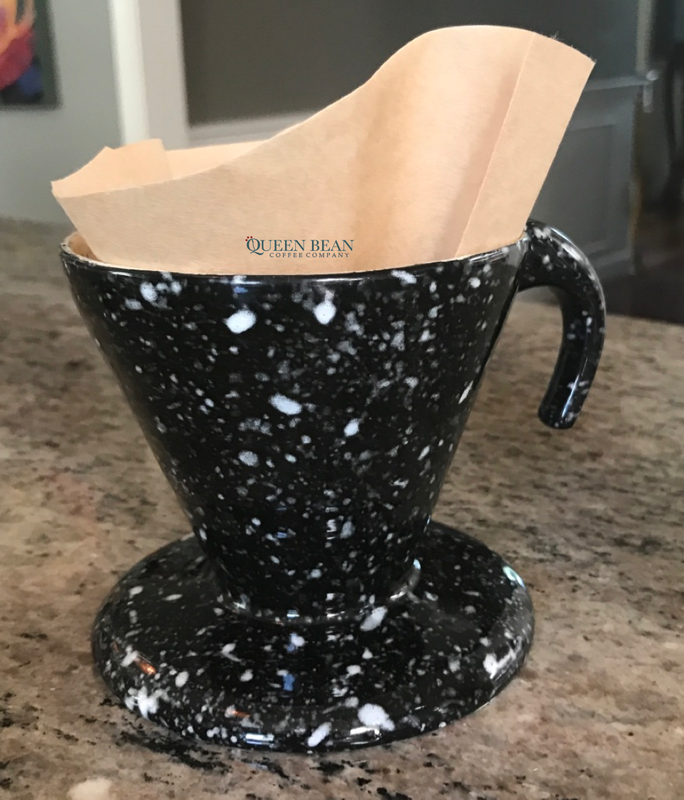 Single cup POUR-OVERs are free standing filters that can be placed directly over a mug. Coffee grounds are placed into filter, hot water is slowly poured – by hand – over the grounds, travels through the grounds, and drips into the cup below as brewed coffee. Properly brewed pour over coffee produces a rich, clean cup with moderate mouthfeel. Click here to learn how to brew the perfect pour-over. Cons: Most time consuming single serve option, no pre-measured grounds, filter must be washed after each use. For additional information on brewing methods, please click here. If you have any questions on single serve brewing options, please feel free to contact us at info@thequeenbean.com. We’ve tried all of the above methods and are happy to opine! *Capsules, such as Nespresso Pods, generally have a similar construct and brewing method to the K-cup. Reblogged this on Running For Coffee.